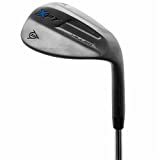 The Dunlop XPT Wedge is engineered with a stainless steel head and a steel shaft for a clean contact with the ball. A gripped silicone handle promotes superior comfort and grip. This entry was posted in Golf and tagged Accessories, Clubs, Drivers, Dunlop, Equipment, Golf, Sports, Wedge by FPSports. Bookmark the permalink.